For the last 17 years, I have rarely traveled far from home. One notable exception to that occurred in the summer of 2001 when I flew to Albuquerque for an Integrative Manual Therapy Intensive at the Desert Light Clinic. My friend Fran had generously offered to go with me; she and her husband donated many accumulated frequent flyer miles that amounted to free airfare. Another friend contributed to the cost of the therapy itself. When we arrived in Albuquerque, we were a bit dismayed to find that the motel we had chosen was next to the freeway. But we figured we’d try it out, and see how it went for the first night. There was a billboard visible from the room window when the blinds were open with a woman bent into a yoga pose in order to sell something other than yoga. The caption read, “We’re flexible.” We laughed, and decided we would be too, at least for one night. It took me until the next morning to fully realize why that night was so hard for me. We had taken a room at ground level so I wouldn’t have to climb stairs. Cars were parked outside the windows facing the outside of the building and beyond them, the highway. So of course the blinds had to be closed. Even when I looked out through the open blinds, I could see no sign of any tree, shrub, or cactus. It was this that disoriented me so profoundly I could barely sleep. I almost panicked in fact, which surprised me, not being a particularly panicky person. It was only then that I understood what was missing: I depended on actually seeing growing things out of my windows in order to relax into a natural rhythm of night, sleep, daybreak. The next morning I found the words to say to Fran that we needed to find a place where I could sleep next to a window, and see something growing outside of it. Wonderful and “flexible” as always, she was game. We searched for a place that had been recommended, but that we had thought was full. It was like little apartments with their own kitchen opening out to courtyards filled with trees, cactus, lavender bushes. I slept in the bed next to the window, and kept the curtains open just enough to see a branch or two against the night sky. All was well. When I first moved into my little blue house, I was delighted to discover that it seemed to have been built in a way that placed all the windows so that the sun traveled around the house during the course of the day. I have no idea if this was intentional, or if it is simply an effect of the long windows in this old house built just before the turn into the 20th century. From the time we first moved to Moscow, the view out the window where I live has somehow sustained me as I adjusted to whatever life was handing me. In the very first place we lived in, a rented townhouse in a four-plex someone from the English Department at the University had found for us, I could see Moscow Mountain out of my upstairs bedroom window. That helped immensely as I negotiated my first Winter ever living in snow, a year that boasted the most severe snow and ice on the Palouse since 1969. When it began, I had not even known what an ice scraper was. Without that mountain being witness to my terror over how to walk and drive on smooth, unforgiving ice, I may never have crossed my own threshold. I would have been inside a long time, since the thaw never came until April. In February of that first academic year, we moved to a little tiny house in the heart of an old section of town. It was adorable, but I could no longer see the mountain. The house next door, which the one I lived in had originally been built as a companion to, towered over it, as did several giant fir trees. I felt a little penned in. The thing that sustained me was the night view through the high windows of the little room that became mine. The moon was always visible through the branches of other deciduous trees, empty of their leaves, and even through their leaves, as the seasons changed. None of these high windows, in either my bedroom or the kitchen, had curtains. Perhaps this is where I first learned the magic of letting the light from the moon or the sun be its own kind of comforting cover. I certainly remember loving the sky down in Southern California. But it was more in passing. Driving down a hill toward the beach, and seeing the grand sunset, with Catalina Island in the distance. Or happening to look up at night while swimming in the pool in my apartment complex and seeing the moon was out. But I was always going somewhere, doing something, never letting the light in consciously. That changed as I gradually became ill, without knowing that was what was happening. When we lived across the street from the house I now own, my “office” was in the front upstairs bedroom of what is now called “Yellow House” by the strings of college students that have lived in it since then. 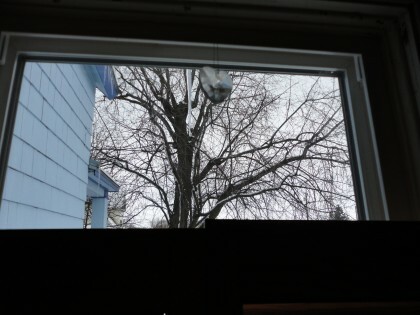 The windows of that room directly face the huge pairs of maples that line both sides of the street. Instead of grading my papers, I would find myself sitting at those windows, staring through the branches as they slowly leafed out, imagining what the little blue house across the street might look like inside. I don’t remember ever closing blinds on those windows either, though they were there. Sometimes, at night, when I couldn’t sleep, sad that the relationship I was in seemed to be ending, and thus lonely being alone in it “together,” I would get up from our bed and go sit in the chair, let the tears fall, and watch the little blue house through the trees. I had no idea I would buy it and live there. In fact I had no idea I wanted to buy it and live there, and no plan to buy a house, or any money saved to do so. But one day I found myself standing at the window again, looking out at the house and the words, “that’s such a cute little house. I wish that house was for sale” came out of my mouth, out loud, to myself. Three days after I said this out loud, there was a ‘for sale’ sign on the lawn of the little blue house. Talk about signs upon a sign. So I figured I had better pay attention, and find a way to buy the house. That was a Friday afternoon. I called the realtor’s number on the sign, and bluffed my way through making an appointment to see the house the following Monday. I had no earnest money at the time I made that call, or even much of an idea of what that meant. But over the weekend I received my income tax refund, so I was all set to make an offer on the spot. I knew the instant I stepped into it that this was somehow the place, the house for Michael and me to live in. And by some miracle I got the house. When we first moved in, all the windows in the downstairs were covered with white mini-blinds. When I got pretty sick the year after that, I went through a period where these would be drawn a lot of the time. They got dusty, and I got too weak to clean them. Sometimes, when no one was around, as diagnosis eluded my doctor, and I attempted to regain some strength, I would lie down on the floor of the dining room with the blinds up enough to make a warm square of light on the floor and lay like a cat (sometimes with the cat we had then) soaking up the sun. The old windows in the house at that time had no UV protection. When Spring came that first year of being mysteriously made an invalid, I would sit out on a beach chair wrapped in a blanket and welcome the sun. When a friend from the English department sent me a wonderful woman to help me clean that she had paid in advance, the blinds would get wiped down. But I began to hate them. I still have some pink taffeta curtains this woman, who became my friend, brought as an alternative, once we took the dusty blinds down. They are still in my cedar chest and have never been hung. In time we took the rods, and later even the hooks for any rods, down. I was too much in love with my naked windows and the changing sky and trees that poured through them into my living room to have it any other way. Their presence and all their changes at the windows seemed to be what made the living room finally live. Most people would find this a bit strange, even bordering on OCD or worse, that I must be able to see living vegetation and changing sky out my windows at all times to relax, feel grounded, sleep. I know there are practical reasons for keeping the curtains drawn, the blinds closed, like keeping the heat in and the cost of it down. In fact I am reflecting on all this because the other night at a friend’s, I insisted on opening the blinds in order to see the view down into the street and the sky beyond the buildings across it. I had felt a little sheepish about my thrill at looking, and then repentant at forgetting to close the blinds, thus losing precious and expensive heat. Yet it still saddens me to think of them closed. I know I am not alone in this compulsion, since another writer, who once grew up in Moscow, gives haunting voice to the same need: Carol Ryrie Brink, best known for her children’s book, Caddie Woodlawn. The character of the French Doctor Duval in her novel Buffalo Coat (on the NY Times bestseller list for two weeks in the 1940s), set in the late nineteenth century during the beginnings of Moscow, is my kindred spirit when it comes to looking out of windows. At home I don’t have a conventional heater downstairs anymore. I have the masonry stove. It’s a big giant “rock,” both a heat sink and a heat generator in the middle of the house that is accentuated by any sunlight that hits it. So I tell myself in a subtle way I am actually helping to keep my house warm by letting as much sunlight as I can in through those living and dining room windows. And at times, because of it, I see wonders those who close their blinds against the outside world never get to see. For instance, there was a time I spent many nights in a row sleeping with Romeo on the couch, so I could see the constellation Orion rise over my neighbor’s tree. Here is an account of one particularly dramatic Fall night during a storm. Since my anxiety level is so much lower from this way of eating, I was simply able to enjoy the wonder of it. “In the early morning hours there was a storm the likes of which I don’t remember seeing before. Maybe because I am not usually sleeping at the living room window. The wind started around the time Romeo and I snuggled in on the couch. I let him outside in it just before then. It began to blow in gusts, and throw up twigs and seeds and small debris against the glass. We dozed off through that, being awakened by it now and again. Maybe around midnight, it also started to rain. Or when I woke up it was raining and the wind was howling. I saw Orion rising, and then it would disappear in the clouds and the rain that came down with the wind. It appeared and reappeared this way several times. I felt so lucky, despite the wind throwing all manner of twigs and branches and stuff against the windows, the mailbox flapping, the love seat on the porch twitching and the lightning flashing. Romeo and I were all cuddled in together, and that same wind moving everything around was tossing those huge banks of storm clouds aside now and then to reveal the most achingly beautiful night sky I have ever seen in town. Recently, sleeping again in my bedroom, where there are wooden shutters over most but not all the length of the windows, I awoke near dawn and padded into the adjacent bathroom. As I got back into bed I saw the full moon shining through the empty tree branches and down onto my quilt, glowing like a pearl set in the western sky. I could lay there and just stare at it. If I turned over, I could look through the open door and out the bathroom window where the sun began to rise in the east. It was magnificent. Though sleeping has become much more restful for me since this way of eating, it still can take my nervous system a while to make the transition into it. At these times I’m always grateful for a window that looks out on the sky’s changing lights and the trees that catch those lights, whether empty or leafed out. Keeping those windows clear to the view is, for me, letting the possibility of healing transformation in. They remind me I am in flux, and that even the most difficult things pass, become something else. Lots of transitions are hard for me, so it’s good to fall in love with at least these most basic ones. It helps me get through more precarious ones. rich tone eluding the names for jewels. in it reaches out and I reach out too. We make contact. A hidden switch flips juice on. Electricity. Water in the pipes. A sweet field glows between us. Then we let go so it can vanish. or light bleaches it pale in vats of sun. through window or air. Only beauty sees us meet. Amen to that. And to light through windows, trees. The stars at night. You’re so very welcome, Silvia, and thank you as well! It’s wonderful to connect with you from half-way around the world through these words. Maria, you express yourself so intimately and so sensitively! It’s a job to read your words and get a sense of the woman you are. Keep up the good work! You are amazing! Each time I see a post from you I can hardly wait to read it. I live in southern California and too have always used nature as a way to connect, relax, meditate and heal. The healing power of this earth, it’s nature and it’s bounty is spectacular and endless. More important is the way we open ourselves to receive these gifts. What a great adventure. Continued healing to you, Julie. Thank you, Maria! This was beautiful to read. Once, when I was in college, there was a blackout all over campus (semi-rural) at the end of the fall semester, coinciding with the full moon. We were all like Where The Wild Things are, frolicking and dancing and jumping out of second story windows onto soft drifts of snow. This is the true power is right! Having lots of windows and accepting the sight and feel of nature is vital to my wellbeing too. Purchasing my current home, the property and windows were of utmost importance. I loved this post. Thank you, Michele! I appreciate knowing we share this lovely affinity for the sight and feel of nature.